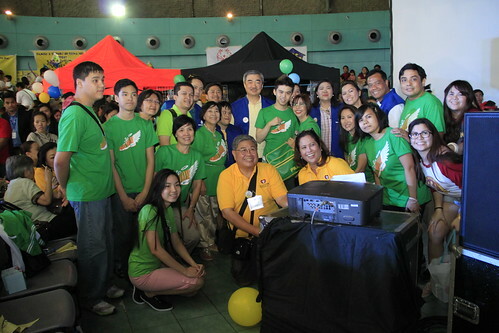 The annual Happy Walk to honor our special fellows with Down Syndrome was successfully celebrated last 23 February 2014 at the SM North Edsa Sky Dome. As an advocate of the Autism Society Philippines, I was HAPPY to venture outside my usual pursuits and HAPPY to have expanded my cause. I was HAPPY with the warm welcome of the participants and the organizers. I was HAPPY with the giant bear hug from Jeremy Lapeña a son of DSAPI president Elmer Lapeña -- it made my day! The Happy Walk was designed to be family-oriented, which explains how each presentation engrossed the audience, made them laugh, sing, and dance along. The crowd was enthusiastic, and the feeling of being part of a very big family was awe-inspiring. Having experienced previous Happy Walk’s, I’ve noticed that the crowd has multiplied several times over! Congratulations DSAPI! Waking up early in the morning to prepare for the Walk was doubtlessly worth it. I look forward to being part of the Happy Walk 2015 and to seeing a stadium full of smiling faces again.